We really do have a lot of rituals that we go through with Amara. I’ve told you about when I leave her house and head home to Grampy, she always has to send him home hugskisspoketicklespiderbites. And when her parents drop her off at our house, well we have a ritual for that, too. 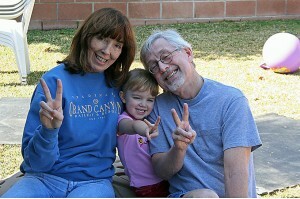 Since Grampy and I both grew up in the 60s, one of the first things that we taught Amara was “Peace”. When Mommy and Daddy would drop her off, the 3 of us would go outside and wave goodbye and wave Peace. Of course back then Amara’s speech wasn’t great and peace often came out as peas. As her speech improved peace/peas became a new and fun game. To which Amara will throw her head back and laugh. Then we all start laughing. Amara loves it when she can do things that sets the 3 of us all of laughing. Between the water wars, the Christmas carols, the art exhibits on the driveway — we must really keep the neighbors entertained! This memory was posted in Grandparents, Outdoors Fun and tagged Amara, art, games, peace, rituals, sixties on February 18, 2011 by Grandma Kc. And I wonder how many of these rituals she will share with her kids???? 🙂 What fun!!! I just want to be around to watch her maintain these rituals with her own kids. What fun would that be — being Great Grandmas? The rituals and the memories of them seem to stay with kids forever. She is going to have a ton of memories! Love to see you having so much fun with the little things like this. A sweet and silly post for the GRAND Social. Thank you for linking it!